Pure & simple, this region is the heartland of the best in class freshwater sport fishing rivers in British Columbia, Canada! 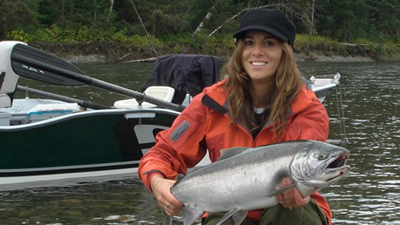 The Kitimat, Nass & Skeena regions watersheds provide outstanding angling opportunities for the adventurous fly-fishers! 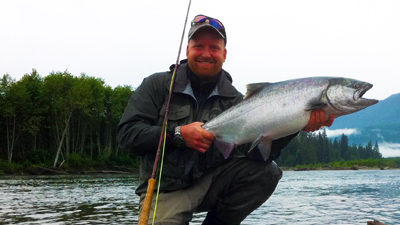 Journey with us to some of the most incredible angling waters on the pursuit of the majestic steelhead! 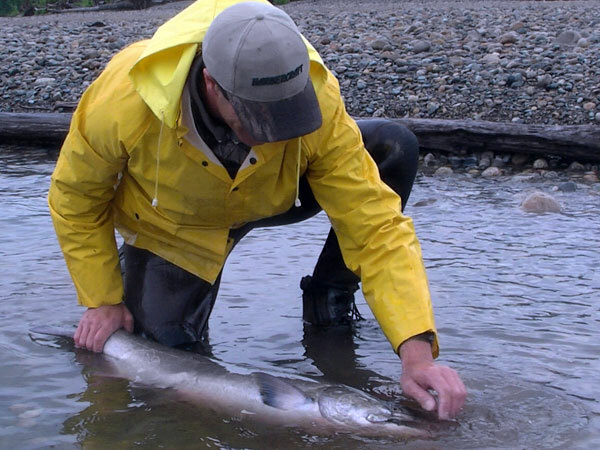 Non-retention & retention regulations apply as well as timely closures on various waters in BC. We highly value the catch & release for future generations. Always remember to release fish responsibly and take only what you will eat. When Fly-fishing is not your game, we have you covered! Rods, reels & gear to get you hooked up! Everything from bait-casting, spin-casting, centre-pin and back-trolling equipment for when and where the action calls for it! 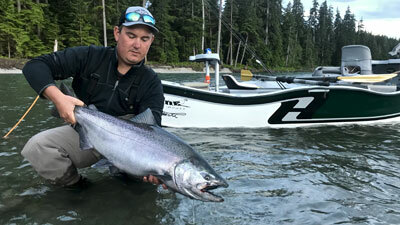 Spring Steelhead float-fishing, spin-casting spoons or chasing down the Big Salmon with various gear that all have there techniques, our guides will share with you the methods & styles to ensure that you have an enjoyable experience! Great fishing year round but we don't like to offer the shoulder season! When the fish are moving, thats when you want to find yourself hooking up with fresh chrome fish! North Coast can be a bit of a tempered beast but when the weather is good and rivers are flowing clean, this is your time to see the shine! Our seasonal fishing index below will give you the best choices in planning your trip with us! 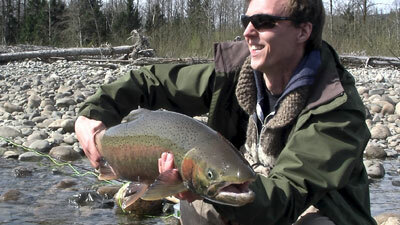 Our spring steelhead program begins here in mid March and continues until the 3rd to 4th week of May. 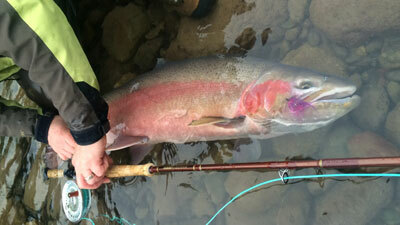 As winter thaws fill the river systems it is time for exciting steelhead fishing in northern BC, Canada. 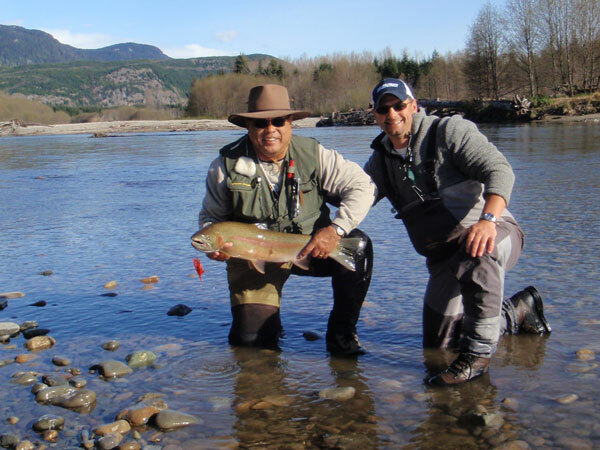 Our classic steelhead expeditions are offered to both fly-fishers (spey and single-hand fly fishing techniques) and conventional gear fishers (float-fishing and/or spin-casting). 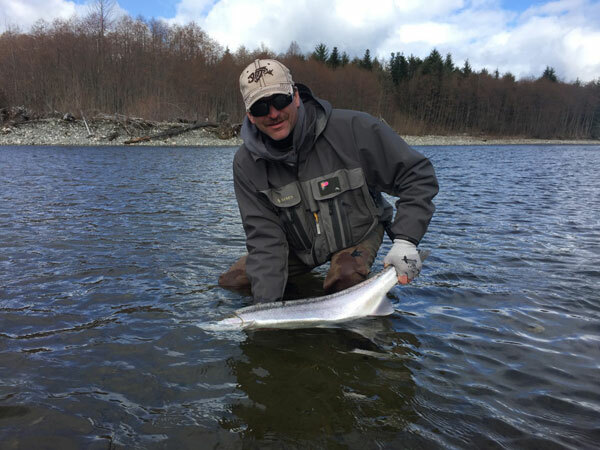 Spring Steelhead ice-off is where the excitement is! Focus on mid March and the following few weeks for strong numbers entering the streams and rivers. Cooler temperatures with frosty mornings and warm afternoons provides classic days on the water. Hot drinks, cold drinks and delicious lunch & snacks provided. Steel-heading is full swing for the month of April. Early mornings and afternoon drifts keeps guests busy running through various sections of the rivers. Drift-boating, rafting and jet-boating transportation provides our guests with various watersheds to hunt steelhead as water levels begin to rise. Hot drinks, cold drinks and delicious lunch snacks provided. Early May the focus is still on Steelhead although over the years we have had guests hooking up with some fiery spring Chinooks! 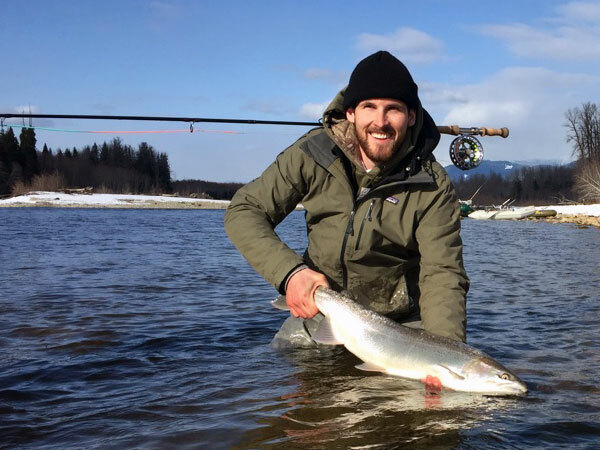 Lower Skeena and several coastal rivers see these early Chinooks start to their journeys home. 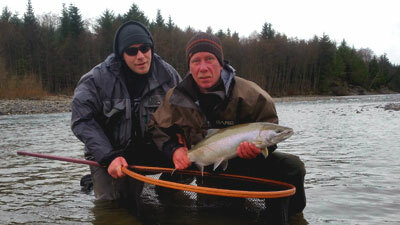 Favourite west coast spey chinook colours at this time of year is not un-common for guests. 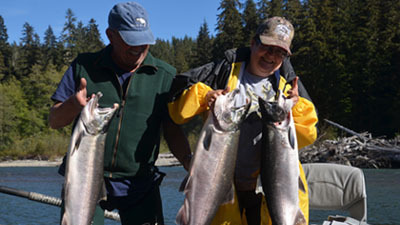 Our summer salmon program gets fired up in June and this is a great time for some feisty Chinook Salmon! These June & July Chinook Salmon are fresh into the rivers and full of energy! 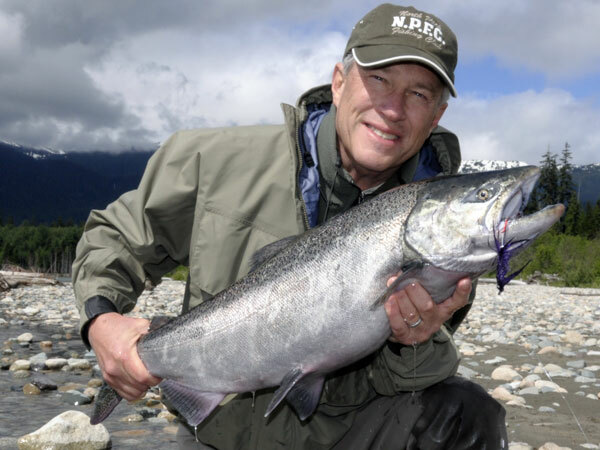 Bust out the big rods and get swingin for some great summer action for Chinook, Chum, Pink, Sockeye and late August Coho Salmon. Second week of June really busts out the Big Ones! Spring run-off triggers these brutes to move in and all focus is on swinging big flies, back-trolling plugs, spoon casting or float-drifting our guided coastal rivers. JULY - TIME TO PARTY! 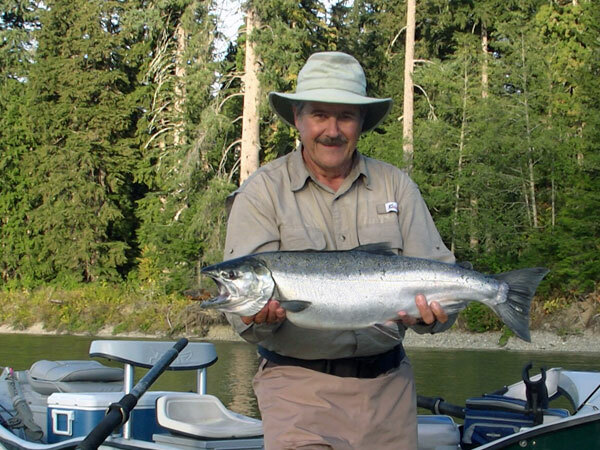 July is full out swinging for Chinook Salmon as well as Skeena Steelhead. Pink Salmon enter the rivers in large numbers providing endless excitement (especially for the young kids new to fishing!) 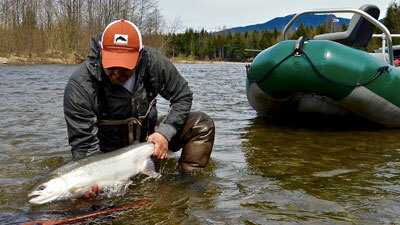 Chum Salmon also start their journey inland and is absolutely insane on the fly rods! August is extremely exciting for all species including the start of Coho Salmon now returning to natal streams! Various methods & techniques provides guests with screaming reels and high-flying acrobatics! Our fall fly-fishing program gets into full swing! 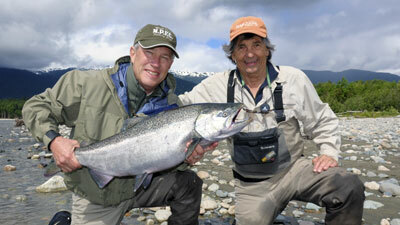 This is primetime for hooking up with great runs of with feisty coho salmon and fresh fall steelhead! Venture into some of northern BC's beautiful coastal streams and experience these amazing eco-systems. September fall runs of Coho Salmon and chrome Steelhead always provides the wildest memories! Whether swinging a tantalizing fly to drift fishing with conventional gear, these fall fish are in good numbers and provide pure excitement! October brings the change of season and great in fall Steelhead fishing with plenty of big northern Coho Salmon to keep guests busy! NOVEMBER - ONE MORE CAST! Colder seasons brings beautiful colours! 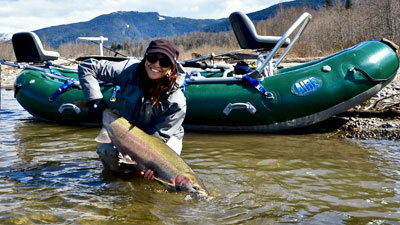 Late Fall steelhead is fantastic for those who can weather the tougher conditions. 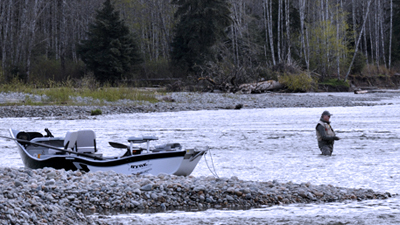 Join us on our late season fishing excursions to remote rivers where we chase after winter over Steel! All Sport Fishers must purchase a Freshwater Sport Fishing License before departure on any of our trips as this is a requirement to fish and/or retain fish species where allowed. If your participating in our Remote Coastal Adventure, please be sure to purchase your BC Freshwaters License.